The Lumber River is the lifeblood of the communities that occupy its edges, including the City of Lumberton, North Carolina. The city owes its location and existence to the abundant resources provided by the river, tributaries, and floodplains. These natural features have made lasting physical and cultural impressions that continue to shape and influence both city and region. Recognizing that river and city are inseparable, this report introduces the concept of a “floodprint” — a landscape planning approach guided by land-water relationships, including the powerful forces associated with flooding. The Lumberton Community Floodprint was the result of interdisciplinary work by NC State University College of Design faculty and students, managed through the Coastal Dynamics Design Lab. It reflects the combined expertise of landscape architects, parks and recreation specialists, and graphic designers who have applied best practices in design and planning to the development of landscape analysis, planning, and design strategies that respect and reflect local character and history. 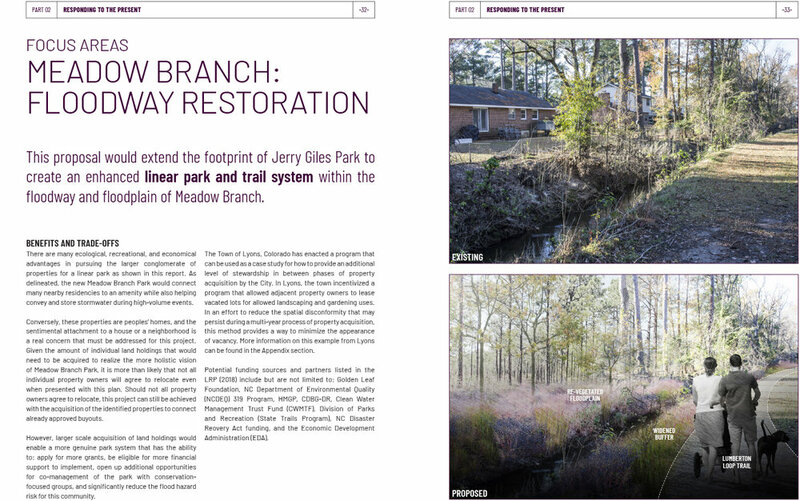 The goal of this project was to help increase social and physical resilience in the City of Lumberton, specifically through recommending land-use strategies that reduce risk and improve public safety and long-term environmental function within historically flood-prone areas. While the report does not offer solutions to keep floodwaters out of Lumberton, it recognizes that the Lumber River and its extensive floodplain lands is significant and must be an integral part of the future landscape of Lumberton. 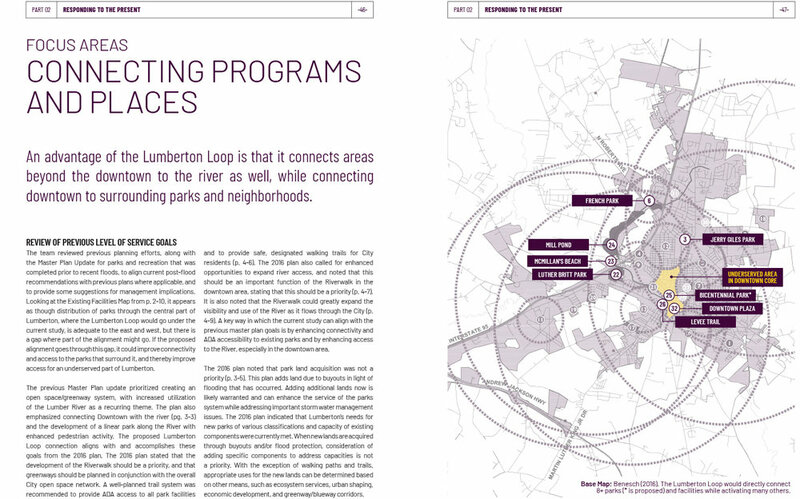 It offers ideas for ecologically sound trails and parks, and it identifies opportunities for Lumberton to transform its vacant parcels into places for recreation and water storage. It proposes ways Lumberton can forge ahead through the difficult task of rebuilding to recognize the power of the Lumber River to promote adaptive design strategies that support long-term efforts of community function, health, resilience, culture, and vitality. This effort contributes to the ongoing hurricane recovery work in Lumberton through an analysis of private and public lands that: 1) were directly impacted by Hurricanes Matthew (2016) and Florence (2018) floodwaters, 2) are within floodways and 100-year and 500-year floodplains, and 3) adjoin or are near existing parklands. The research team considered hazard-related issues facing the larger southeastern region of North Carolina, including the known and potential impacts of recurring floods, development patterns, and population trends within the Lumber River watershed. Additionally, the project was guided by landscape planning approaches to development, conservation, and management practices and uses. Emphasis was placed on assessing short-, mid-, and long-range planning options. The resulting recommendations are tied to existing community assets and, where appropriate, county and regional recovery planning efforts and existing recreational programs. 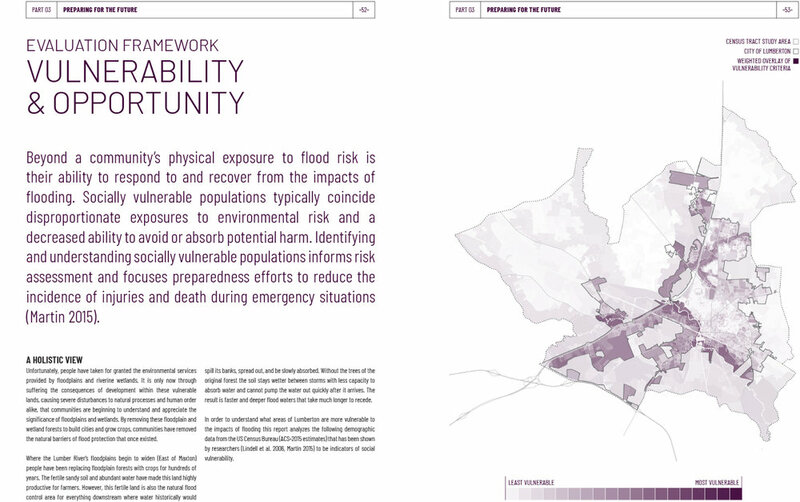 Recommendations also address a variety of spatial and temporal scales of open space planning and management within the context of disaster recovery and hazard mitigation. 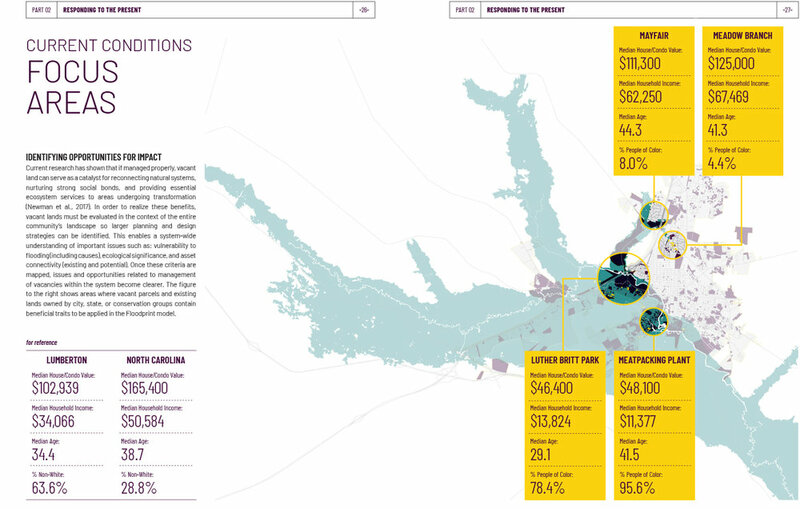 Lastly, the report suggests community engagement activities to support equitable design and implementation of the proposed options.